facts and information for you. The good news is that the sun could provide us with all the energy we need. The bad news is that it isn’t. Instead we burn a LOT of oil and coal. The sun could power the world! In just 71 minutes the Earth is hit by enough solar energy to power the world for one year. If we could exploit just one tenth of one percent of this energy we would have more than enough energy to meet the world's total energy demand. The energy potential from hydro, solar and wind energy is absolutely mindboggling. Yet, only 4 percent of the world's energy consumption is covered by these clean and renewable sources. The municipalities of Thy and Mors in Denmark is the worlds largest area where electricity is produced entirely from renewable sources. Moreover, 85 percent of all heating is from “green” energy, and less than 1 percent comes from fossil fuels. Watch the inspiring video. There are many ways to increase the use of clean renewable energy. For example by installing solar panels or by investing in geo-thermal heating. 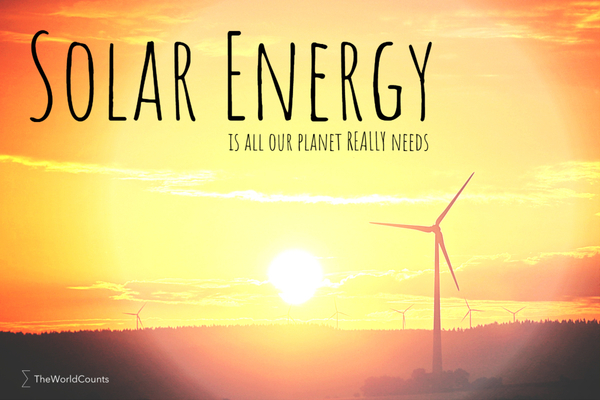 In one year, Earth absorbs 3,850 billion terajoules of solar energy. This is the same amount of energy as 1,900 Hiroshima nuclear bombs every single second - and more than 7,000 times the energy we use. Of course, this does not mean that we could actually recover that amount of energy. But it illustrates that solar power offers an enormous potential. Thisted Municipality is a copybook example of local drive and initiative. That’s why it is also the cleanest municipality in Denmark. Over 100 per cent of power consumption and more than 80 per cent of heat consumption is catered for without the use of fossil fuels. The renewable energy comes from sun, wind, geothermal power and biomass. So success is the result of versatility and an intelligent use of already existing technologies. In 2007, Thisted Municipality was awarded the European Solar Prize for its work on utilising renewable energy. Interested in more facts like the solar energy striking earth? Then plug in and subscribe to our newsletter.